Spring has officially sprung in Australia (1 September) and so now is the time to do a spring clean of your law firm if you want to give yourself the best chance of making a strong start to 2016. Audit your client list – to see who the best performers have been, who the up and comers are, and who have fallen off a bit. Review your revenue streams – to see which practices are getting revenue from which clients. Remember, the more practice groups that are getting instructions/revenue from a client, the more likely that client is to be a profitable client. Review and update your ‘key’ (which should include decision makers as well as supporters) contacts database and update their preferred method of communication (phone, email, chat, Facebook, tweet?). Hold an off-site firm strategy day that includes a review of market conditions, expected client demands, and how your firm will respond to these. Segment your client contact database by industry, etc so that clients receive the most appropriate information from you – rather than blasted mailshots. Start thinking about your FY2017 client listening program – who will you go and visit? Will you be doing this internally or externally? Start thinking about your FY2017 communication plan. Review and update your referrer / firm champion list. Look up what industry events will be taking place in 2016 and see if you need to be attending these. Consider ways that you can be adding value (via your value added services) to your client relationship that might differentiate you from your competitors. I cannot guarantee that you and your firm will be star performers in 2016 if you carry out this spring clean, but I can guarantee that 2016 will [at best] be a fairly ordinary year for you and your firm if you don’t action these and more. Does your firm have a ‘Customer Loyalty Program’? Interesting post on the Harvard Business Review blog today: ‘Why Your Customer Loyalty Program Isn’t Working’ by Michael Schrage. Organizations need to identify the loyal behaviors that most deserve explicit recognition, reward, and investment. How should loyalty from the best and/or most valuable customers be recognized and rewarded differently from that of typical or average customers? However, leaving aside internal facing Client Account Teams, which are typically created for cross-selling or cross-serving purposes, or even client facing Client Listening Programs – both of which I strongly advocate – I do wonder how many law firms run a client loyalty program? And if so, what does that entail and what are the criteria used to qualify for the program (and are clients aware of how they can qualify for the program?)? For example, are discounts offered on volume work a form of client loyalty program? You may initially think this to be the case, but I if I were to run an audit of your firm’s client files I bet I would discover that partners offer NEW clients much better discount offers than they do EXISTING and LOYAL clients. If so, then volume discounts aren’t a loyalty program as I could probably do better going somewhere new (even with you) than I do staying with you. Are invites to golf days a means of a client loyalty program then? Again, possibly, but by what criteria are invites to such events made? I’m not sure there are any – in which case, they aren’t a form of client loyalty program really. All of which is to say, I think it will be interesting to see whether or not law firms adapt to implement formal ‘client loyalty programs‘ in the future as I definitely see them as being a differentiator. True loyalty doesn’t just serve and preserve valuable customer relationships; it creates and inspires more valuable customers. Loyalty is a mutual investment, not just an exchange. If you haven’t read the post, I would like to suggest you do. And if you are a law firm thinking of implementing a client loyalty program, then my cousin just happens to run one of the very best in the world. RSS feeds: we will start off easy, set up an RSS drop box email account (I use Gmail) and sign-up to as many news and industry sources as you believe you need to give you as much relevant market information as possible. Keep in mind that if it’s in the “papers” you’ve most likely missed the boat, but you can still find the odd nugget this way. Apps to read on the go: in addition to having RSS feeds, I also have a number of news and blog feeds that I read on my iPad on the way to work through the Ziner app that are fed through Feedly. Previously I used to play solitaire on the train, but I’ve actually had some real wins since doing this. Network internally: if your firm has an intranet site, make yourself visible on this. Offer to publish updates or other useful information that will increase your profile internally. I’ve found this particularly useful in multiple jurisdiction and cross-border firms where you might not always get the opportunity to meet with your colleagues and show them firsthand how great you are! Even if you work in a one office firm though, increasing your profile internally – via the old water-cooler chat – can help build your profile and the trust your peers have in your abilities. Be present on Twitter: not only is Twitter a lot of fun, but it also offers you a free and easy way to increase your profile and network globally. And you’ll be surprised how often someone in your network (of Twitter followers) is asked by someone they know (but you don’t) for a recommendation in your jurisdiction, and guess who they will be recommending! Blog: again, a free (or at worst relatively cheap) and easy way to highlight that you are a thought leader in your area of expertise. It may also lead to other publishing opportunities that will help to promote your brand as widely as possible. And it doesn’t even have to be that long or complicated a post on your blog – just make it authentic and consistent. LinkedIn: I suggest people be ‘present’ on LinkedIn. This means using this platform as more than a modern rolodex for contact cards. Join and participate in industry groups that are relevant to your practice. Better yet, join and participate in groups your clients or target clients are active in. And if there are none, start your own! Publish: publish articles and materials that showcase how brilliantly you know your subject matter and how it applies to your clients businesses. I would suggest that you don’t do this in peer-to-peer [lawyer] publications, but find out what publications your clients like to read and try and get published in these – even if that means you are publishing updates on the automotive industry in a car magazine! Participate in client relationship management teams: you would be surprised what you can learn from CRM team meetings. I’ve seen millions of dollars generated in these groups over the years. But here’s the thing: you and your firm need to be engaged and willing to share information in order for it to work. Sector group meetings: same as 8 above, only along the lines of a sector rather than a specific client. Here, think back to how successful study groups were for you at high school or university – where you all shared information to help each other improve. Well the same principle applies, only the rewards can be [financially] much greater! Be visible: offer to spend one day a week or month working in your client’s office(s). Don’t charge them for it, just ask if you can use an office there. Then let them drop by for a coffee and a chat. You’ll be surprised by how many potential new matters you’ll have by the end of the day! Industry events: attend and participate in as many as you can. Not only are they great for networking, but they’re also good for insights from business leaders into the direction the market is heading. So, if you haven’t already, head off and join your local chamber of commerce or industry body organisation. Study: study broadens the mind. It also brings you into contact with likeminded people who might need your help. So if studying is your thing, this is an excellent venue where you can not only build your reputation as being a knowledgeable thought leader, but also bring you into contact with people who may need your help. Be social: don’t spend every waking hour at the office, be social. Attend your local sports or drama club events, because you never know who you might meet at these venues and the next person you meet could well be your biggest client this year! Accept feedback: always be willing to accept feedback as this will likely result in: (i) a platform where trust can be built, in that if your client sees that you are willing to listen to their feedback and improve your service delivery based on that feedback, they’re more likely to trust your abilities going forward (and this is true even where you make mistakes), and (ii) you being more aware of forthcoming work than you might otherwise have been. Always be willing to ask for help: lastly, always be willing to ask for help. That can be in the form of a mentor, coach, business trainer or rainmaker. It could be as simple as asking for help being introduced to someone you don’t know but want to get to know. How it’s done is not the important part, it’s in the asking: keep in mind that everyone, and I do mean everyone, has or will need someone else’s help at some point. And at some point, someone will ask you for your help – so give generously if you can! 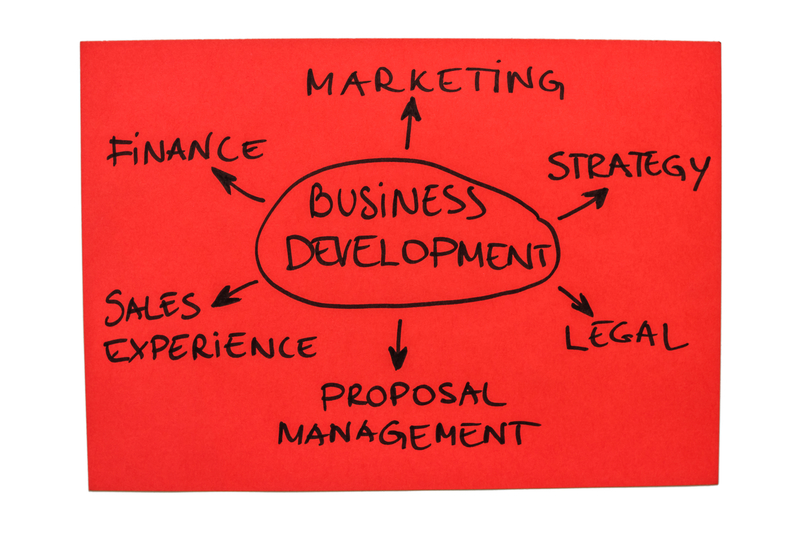 There you go then, 15 ways for you and your firm to find business development opportunities going forward this year – and if you can think of any more, let me know via the comments section.